The W.D. & H.O Willis British cigarette manufacturer out of Bristol, England included advertising cards in their packs of cigarettes. In 1933 the company produced 'Garden Flowers' among other general interests cards like ones about British butterflies. This one (ca. 1935-1939) gave garden hints like how to sow small seeds. 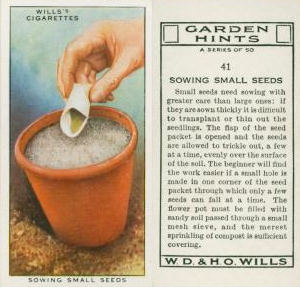 There is even a card demonstrating how to sow small seeds by submerging the pot in water, instead of sprinkling water from the top on your seeds which will cause them to spill out. You can see some of these beautiful gardening related cards here, the images in the post are from the NYPL Digital Gallery. Oh! I just saw this post! I actually have a large love of these cigarette cards and I have tons of them, and the whole collection of this one you're showcasing here. They actually have tons of great info on their backs, and they're extremely easy to start collection, you can get huge collections of them on ebay for cheap. I should've known you were a collector of these. I'll have to check out Ebay and get some for myself. I suggest going out for a big mixed lot your first time out. Gives you a nice idea of what you can get. There are some REALLY pricey collections, but like I said, some are dirt cheap because the quality isn't so good or they're all mixed and matched. Antique stores are a good place too, it's where I got my first ones.